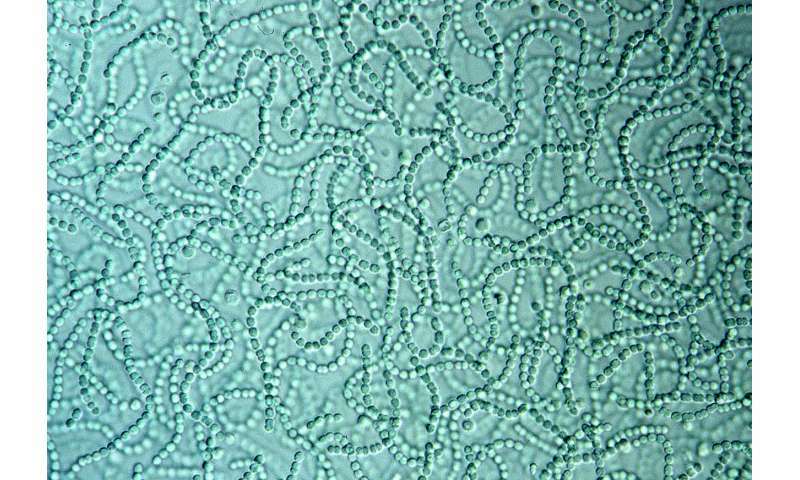 Cyanobacteria perform a relatively sophisticated form of oxygenic photosynthesis—the same type of photosynthesis that all plants do today. It has therefore been suggested that simpler forms of oxygenic photosynthesis could have existed earlier, before cyanobacteria, leading to low levels of oxygen being available to life. Lead author Dr. Tanai Cardona, from the Department of Life Sciences at Imperial, said: "We know cyanobacteria are very ancient, but we don't know exactly how ancient. If cyanobacteria are, for example, 2.5 billion years old that would mean oxygenic photosynthesis could have started as early as 3.5 billion years ago. It suggests that it might not take billions of years for a process like oxygenic photosynthesis to start after the origin of life." This shows that D1 and D2 have been evolving separately—in cyanobacteria and plants they only share 30 percent of their genetic sequence. Even in their original form, D1 and D2 would have been able to perform oxygenic photosynthesis, so knowing how long ago they were identical could reveal when this ability first evolved. To find out the difference in time between D1 and D2 being 100 percent identical, and them being only 30 percent the same in cyanobacteria and plants, the team determined how fast the proteins were changing—their rate of evolution. Using powerful statistics methods and known events in the evolution of photosynthesis, they determined that the D1 and D2 proteins in Photosystem II evolved extremely slowly—even slower than some of the oldest proteins in biology that are believed to be found in the earliest forms of life. Dr. Cardona said: "Usually, the appearance of oxygenic photosynthesis and cyanobacteria are considered to be the same thing. So, to find out when oxygen was being produced for the first time researchers have tried to find when cyanobacteria first evolved. The used age for the cyanobacteria root (Gloeobacter is claimed as a close sister) is in the lower end of the posteriori credibility of https://disq.us/u...=2285912 (Fig. 3), which uses Gloeobacter as a calibration node. FWIW, while trees push the roots as far as they can, the statistical credibility for life emergence in the latter fossil and genetic synthesis paper is a further 1 billion year back, just after the Moon forming impact and and additional 40 Myrs for crust formation. So the discussion of oxygenating photosynthesis likelihood may be slightly biased by - ironically - a conservative dating of life. That you managed to translate that much information out of this garbled mess of an article? Is a credit to your shrewd judgement.